With all that Bedré Fine Chocolate has to offer, we are sure you have questions. View our FAQs below to find answers. Like most of the commercial chocolate produced worldwide, we use cacao originally grown in Central America and North Africa. What’s the connection between Native Americans and chocolate? Chocolate was originally cultivated by the indigenous people of Central America before being exported to Europe in the 16th century. Today, the Chickasaw Nation is the only Native American tribe to manufacture chocolates. Read our Rich History of Native Chocolate to learn more. Where can I buy Bedré Fine Chocolate? Aside from our website, Bedré Fine Chocolate is available from the Bedré Fine Chocolate retail (now located in Sovereign Pharmacy Solutions and Fine Gifts) in Ada, OK, and Bedré Fine Chocolate retail located in Davis, OK, as well as Chickasaw Travel Stops (CTS), The Artesian Hotel, Bedré Café, Exhibit C Gallery and in retail stores across the country. Visit our Find Us page to see locations across the country. What sort of quality management do you have for your manufacturing process? Bedré Fine Chocolate is ISO 9001:Certified, an internationally recognized and globally respected standard quality management system. 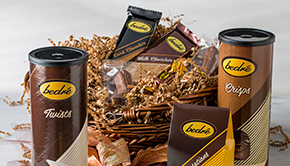 Bedré Fine Chocolate is also a member of the Oklahoma Minority Supplier Development Council. ASI Food Safety Consultants performs annual Good Manufacturing Practices (GMP) and HACCP verification audits to assure continued compliance to regulatory and food safety guidelines. Where is your allergen list? All Bedré products are manufactured in a facility that produces products that contain wheat, soy, eggs, dairy, peanuts and tree nut. This allergy warning is also visible on our packaging. How is Bedré Fine Chocolate shipped? Our orders are shipped securely with insulation and ice packs in regards to climate and temperature. Do you have more questions? Contact us now to learn more!